The first vintage sheet includes the Gothic front and The Entombment of Christ. The second sheet depicts Golgotha and three figures, including the Virgin Mary. The Resurrection appears on the third sheet. When I was growing up in Greece it was Easter, not Christmas, that children eagerly anticipated. On Good Friday, when the tolling bells of neighboring villages echoed from the hills, we'd be gathering wildflowers and blooming branches to decorate the Epitaphios*, a wooden canopy representing Christ's bier. On Friday evening everyone follows the procession of the Epitaphios around the church while The Lamentations are chanted, laments for Christ's Entombment. At midnight on Good Saturday everyone gathers for the glorious midnight Easter liturgy of what the Orthodox Church calls The Feast of Feasts. The dark church is filled with light from candles held high by the faithful chanting Eastern Christianity's triumphant hymn, Χριστός Ανέστη, Christ is Risen. Would there be a new pair of shoes for me to wear to church? Yes, if my father had sold his plaited onions at the Kopanaki farmer's market the Sunday before. When, at nine, I moved to the city to live with my adoptive parents that one day would bring me to America, Easter also meant cutting out a scene of Christ on the Cross, the Virgin Mary, and the Beloved Apostle that was pasted on plywood. 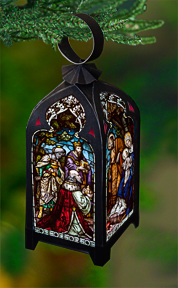 I would set this little shrine on my window with an oil lamp burning in front of it. These are the memories that flooded my mind the other day when, while cataloguing my collection, I came across a vintage sheet titled Grablegung Christi, in German, and Le Saint Sépulcre in French: The Holy Sepulcher. The Holy Sepulcher consists of three bogen, feuilles or sheets, yellowed, discolored, and brittle with age — the corners literally flake away at the touch if you're not careful. 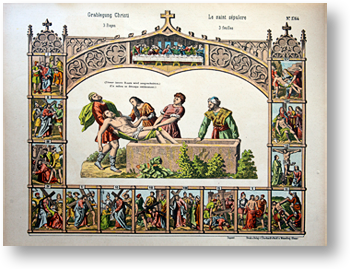 As you can see in the images at left, the first sheet features the Entombment of Christ and a front whose Gothic tracery is decorated with trefoils and finials — and the Stations of the Cross. Following in the footsteps of our Lord is an ancient form of Christian devotion. Representing Via Crucis, The Way of the Cross — the Via Dolorosa, or Way of Sorrows, said to be the path followed by Jesus from the Praetorium to Golgotha. The Stations of the Cross became a spiritual pilgrimage for those unable to make the arduous journey to Jerusalem. In churches throughout Christendom, the Stations of the Cross enable the faithful — alone or in procession — to prayerfully follow in the footsteps of Jesus. Over the centuries — as small shrines, mosaic panels, paintings, sculptures, or wood carvings — the Stations have graced not only churches, but also monastery cloisters, approaches to Holy Places, and private lands. The Stations are powerful expressions of sacred art, ten of which are based in Biblical accounts, and four rooted in Church tradition. In The Holy Sepulcher sheet, the Stations of the Cross are depicted in oblong panels, labeled with Roman numerals I-XIV, 1-14, starting at the upper left hand corner with the First Station, Jesus is Condemned to Death and ending at the upper right with the Fourteenth Station, Jesus is Laid in the Sepulcher. Above, in the center of the arched front is the Last Supper, and below, a large depiction of Jesus is Laid in the Sepulcher, the centerpiece of this vintage The Holy Sepulcher diorama. On a second sheet is pictured golgotha with the True Cross of Christ and two tau crosses of the thieves as well as three figures, including that of the Mother of Jesus, to accompany the scene of The Entombment. And on the third sheet, besides the base, and side panels lovingly decorated with Gothic motifs, is pictured The Resurrection. Five Roman soldiers lie on the ground, and behind the Risen Christ an angel holds the lid of the empty tomb. It is this scene that I chose to present as The Diorama of the Resurrection in a Premium Download sized to print on letter-sized paper. 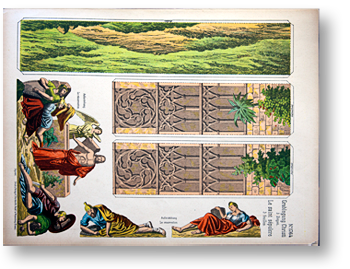 And for those whose printers might not be up to the task, The Diorama of the Resurrection is also available as a quality Printed Sheet. I'm about to cut out and assemble my Diorama of the Resurrection this afternoon. Then I'll light my oil lamp — just as I did all those years ago. * Actually, epitáphios is the richly embroidered cloth representing Christ's Entombment that is placed inside the wooden bier, which should properly be called kouvoúklion. But everyone calls it epitáphios. 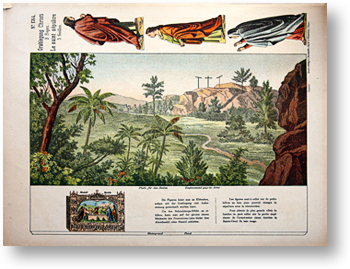 The Diorama of the Resurrection could serve as a wonderful aid for personal devotion and home, church, or school catechism.